Early in the 1990s, Tremayne Cleveland and his cousin brothers and sisters used to climb in the back of their Grandpa John Tso’s pickup to visit Mr. Tozer in McElmo Canyon. They were headed to his watermelon patch, a short 19 miles east of their home on Cahone Mesa in the Navajo Reservation. All the children, now in their early 20s, were under 10 in those days. They loved the trip. It was special. It was an adventure with their grandfather, fun and happy. Ismay Trading Post is on the map at the confluence of McElmo and Yellow Jacket canyons. It is the last stop on the road to the Navajo reservation from the east side in Colorado. For many decades it offered one-stop shopping for people living beyond the end of the road. Customers could pick up mail, general store goods, seasonal fresh produce and flat-tire repairs all in one place. Eleanor Heffernen Ismay, Robert’s mother, and his father, John Ismay, built the adobe trading post in 1921 with the help of Eleanor’s father, Jim Heffernen, who also built the Oljeto Trading Post, which is still in operation today. Her story unfolds on the 30-minute mp3 as a bustling, rich, cross-cultural and knowledgeable business endeavor. Today, the wagons are gone, but the trading post remains. The store sits 50 yards from the current border of the Navajo Nation. It is the closest business establishment to the reservation and still meets many needs of the people living around Aneth and Montezuma Creek in Utah. The Ismay family kept up with the times, offering goods and services reflecting changes in transportation and commerce as well as family needs. On this crisp October day, Leda Blackhorse Nez walks through the door to buy a bottle of water from Ismay. She moved back this year to her home on the reservation a few miles west of Ismay after spending 21 years off the reservation working at her career in elder care. She is glad to come back and happy to bring her grandson into the store where, she recalls, her mother would take her each year just before the school year would start. While Nez shows the trading post to her grandson, owner and proprietor Robert Ismay reaches under the counter for a telephone. He places it on the counter in front of an elderly Navajo couple who want to make a call. It’s a beige 1960s model, the kind where the receiver is cradled in the base. Each of them takes a turn on the phone. Their conversation, in Navajo, is soft and gentle. They hang up and let him know the phone will be ringing back for them. They’ll wait, they say, and he nods and then they spread out pocket change on the counter to pay Ismay for the call. Land-line telephone service is sporadic even today in the Utah Navajo strip. People use cell phones now, so demand for the land line has diminished, but he still offers the service, especially for the elders, who may need the convenience of calling near home. Over the years, gasoline also became a low-demand item at Ismay’s. Once available at two pumps in the parking outside the building, it is no longer a feasible investment, Ismay says. “There’s a lot more traffic now, but when our gas costs more than Cortez, people buy a dollar and it’s almost not worth going out to turn it on.” A few years back Ismay took the pumps out, replacing them with a concrete barrier. The vintage metal shells now stand beside older, replaced pumps rusting in the weather behind the shop — footnotes to the Ismay story. The interior of the shop is dusty. Really dusty. The lighting is naturally dim. The shelves today offer only bare essentials — tools, enamel bowls, cold soda pop, water and ice tea, a spare selection of canned goods — beans, chili, Spam, tomatoes — stacked neatly beside noodles and flour, baking soda, oil and transmission lubricant. A lot of the store’s merchandise is used in ceremonial life on the reservation – water buckets, rawhide for clothing, implements and drums, gourds, some weavings, cloth and wedding baskets. Although the merchandise is re-stocked often, the selection rarely changes. Even the classic turquoiseand- silver Navajo jewelry displayed under the glass counter and piñon-seed necklaces hanging above the Big Hunk candy bars look like they have been there for 20 years. On the counter near the front door in light falling through the window there sits a box filled with empty pop cans – recycling at Ismay’s has always been part of the business. There is no background noise, no computer or radio playing, no commercial lighting or neon “open” signs. Ismay’s polite, laconic responses — “yup,” “spoze so,” and an occasional tip of the cowboy hat and a smile — dampen the clamor and din of the modern world 30 miles up-canyon in Cortez. Ismay was one of nine children that Eleanor and John raised at the site. Robert Ismay continued his education at Western State College in Gunnison, Colo., majoring in history and political science with a minor in physics. He wanted to be a teacher. Two years later he enrolled, instead, in the Army anti-aircraft artillery during the Korean War for training as a radar repairman and was stationed in Seattle, where he guarded the Boeing aircraft factory until his discharge. Of the nine children, only Robert and a sister, Laura, survive. She married Sherman Hatch and lives at Hatch Trading Post on the north side of Cahone Mesa at the mouth of Montezuma Creek Canyon, not far from Ismay. A story circulates out there that one day Sherman rode his horse over the mesas and asked for Laura’s hand in marriage and then put her on his horse and rode back over the mesa. When asked about the story, Ismay grins widely, but says simply, “That’s not true,” and offers no further comment. A brother, Eugene, came home to the trading post after serving in the Navy during the Korean War. They operated the store together from 1958 until Eugene passed away five years ago, leaving Robert the sole proprietor. When the McElmo Canyon road was paved all the way into Utah in the 1990s, it put a further dent in Ismay’s business as the drive to Cortez and its supermarkets became much faster. However, many locals still support the trading post and value its presence. She overheard a woman in a Cortez coffee shop say that she feels it’s important to buy something from Ismay’s, even a bottle of water, like a toll. Tilsen agrees and recently took two visiting friends from Pennsylvania and New York out to Hovenweep National Monument via McElmo Canyon. Many of the new customers today are coming for the archaeology. Ismay keeps a stack of academic documents behind the counter showing some of the research that’s been published about his property. “Archaeologists started coming about two years ago,” says Ismay, pointing to a photocopies printed with fading drawings of elaborate rock art that can be found in the area. “Those figures are as tall as us,” he says quietly. Now many generations old, the trading post feels like a throwback in time, a tableau of history. He grew up with the site, and local people respect that. Grandparents and parents introduce their children to the trading post as if it’s a safe place to begin engaging with the world beyond the reservation boundary. Eli Tso, like others who live nearby, is careful to describe whether it’s the father or the son he’s talking about. He loved going to visit John and Eleanor Ismay with his own mother and father, and now, as an adult, he stops in almost every week with his children and grandchildren. If you ask members of Colton Morgan’s family where they are from, they often say, “Ismay.” They live a few miles west of the trading post and their home address is Aneth, Utah, but they identify with the wellknown and beloved landmark. 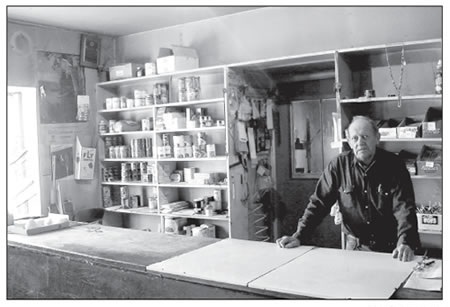 The trading post is 90 years old. Ismay admits to thinking about retiring, but for now, he says, he’ll just be open when he feels like it, to have something to do.